Team Fiji welcomes Government’s continuous support towards participation at the 15th Pacific Games in Papua New Guinea next month. 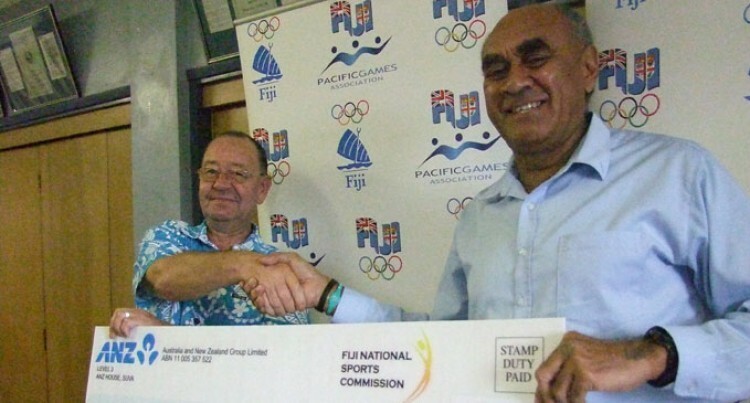 The Fiji National Sports Commission presented $300,000 to Fiji Association of Sports and National Olympic Committee yesterday. This brings Government’s contribution to $600,000. FASANOC’S president Joseph Rodan Senior welcomed the assistance. “We had submitted for Government’s consideration our justification for an increase in funding allocated to Team Fiji in 2015,”he said. “With Fiji participating in 25 sports programme and 11 of them team sports, reducing teams have been very difficult,” Rodan said. Rodan Snr said the Pacific Games would be a good opportunity for the young athletes to expose their talents. “The team of 423 athletes majority of them are students and young people and this will be a good exposure for them,” he said. Commission’s chairman Peter Mazey stressed the importance of development. “It’s important to grow our youths,”Mazey said. “We just saw the performance of our Vodafone Fijians U20 football side and we are working with FASANOC on a four-year for the next Pacific Games and Olympic Games,” Mazey said. Rodan confirmed team Fiji needs another $150,000. “We need another $150,000 and as its important that we all go to PNG. “Fiji being the powerhouse in the region we want to be well represented at the games. To send the team of 423 to the games costs us roughly of $2.1m. Rodan Snr said FASANOC had also sought Government’s further support to waive departure tax for Team Fiji which amounts $89,500.